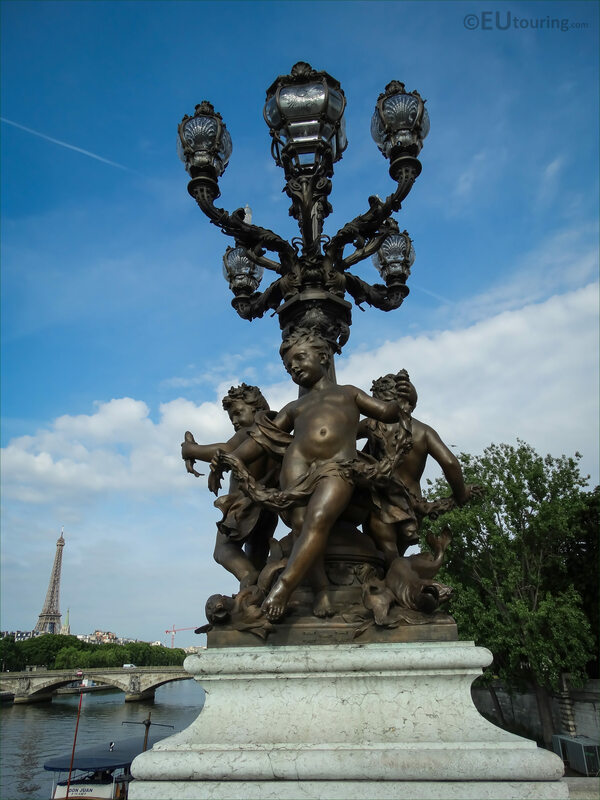 While we were at the Pont Alexandre III we took these high definition photos showing one of the candelabras adorned with sculptures called Les Amours, which were sculpted by Henri Desire Gauquie. 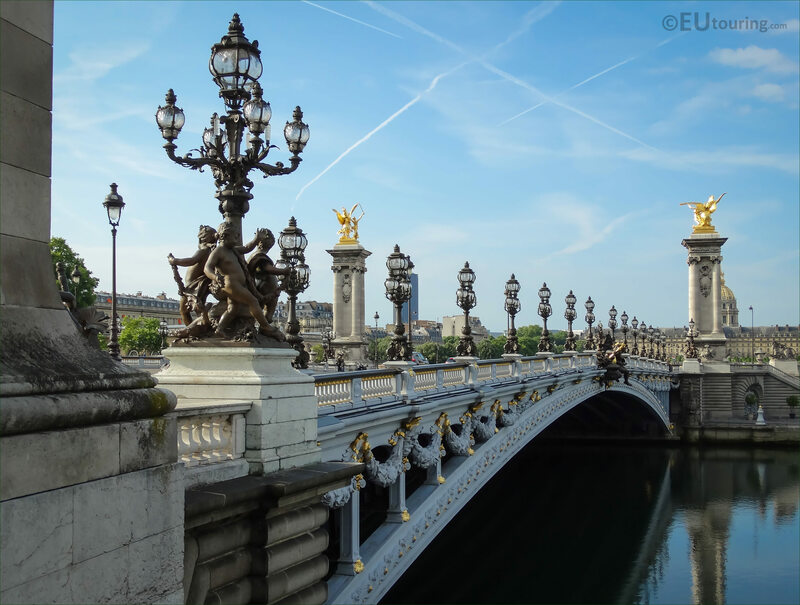 The Pont Alexandre III was designed and constructed for the 1900 World Fair in Paris at the same time that the Grand Palais and Petit Palais were also constructed, and numerous different artists were commissioned to produce different sculptures and statues to adorn these tourist attractions. And named after the Tsar of Russia, Alexander III, who concluded the Franco-Russian Alliance a few years before, this bridge goes between the left bank in the 7th Arrondissement where you will find Les Invalides and the Eiffel Tower further along, and the right bank in the 8th Arrondissement close to the Avenue des Champs Elysees. 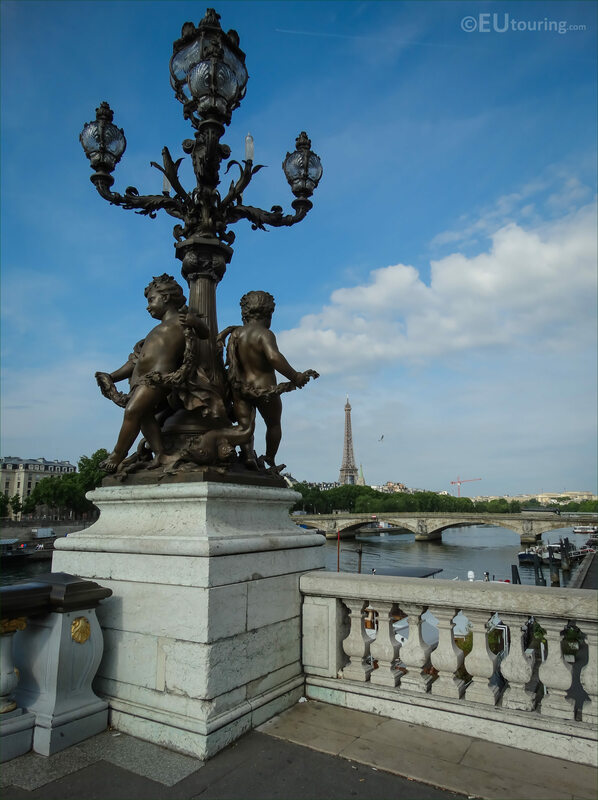 Now the Pont Alexandre III has been classed as an historical monument, but is often referred to as the most elaborate, extravagant and ornate bridge over the River Seine, as you can no doubt tell just from this close up HD photo showing one of the bronze candelabras. 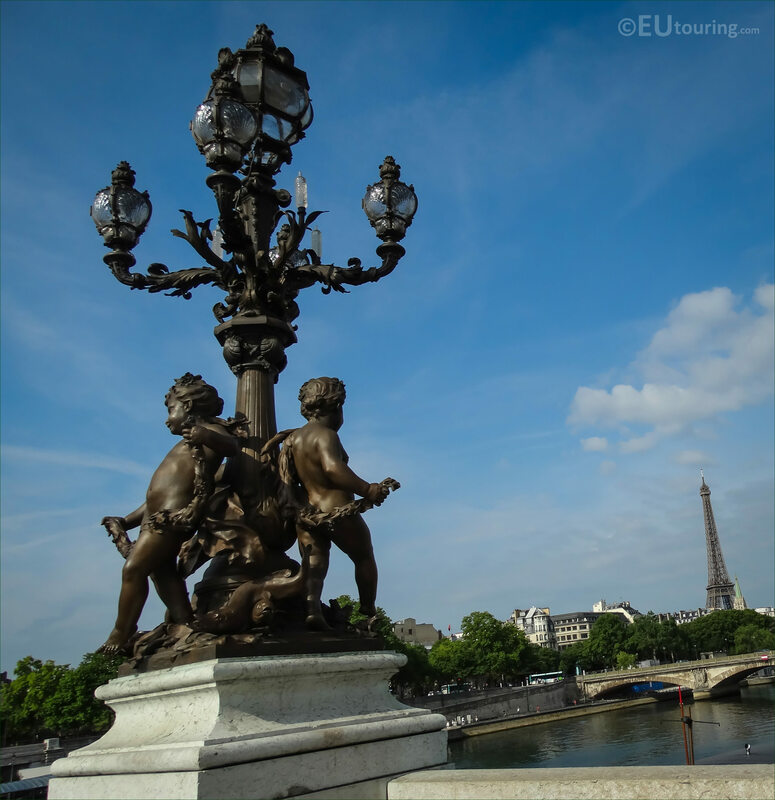 There are actually four candelabras on the Pont Alexandre III located by the 17 metre high columns and these have different figures that were sculpted in bronze and are called Les Amours, which in English translates to The Loves, yet sometimes they get referred to as cupids. 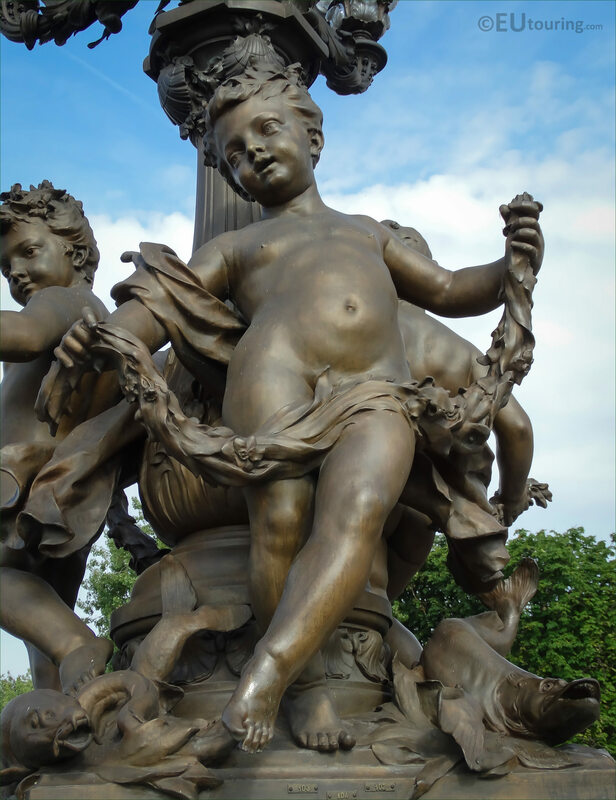 So this next high definition photo shows a close up of one of the Amours or Loves holding a garland with fish at its feet, and sculpted by Henri Desire Gauquie, you will find that each candelabra is slightly different, yet are all on the same theme. 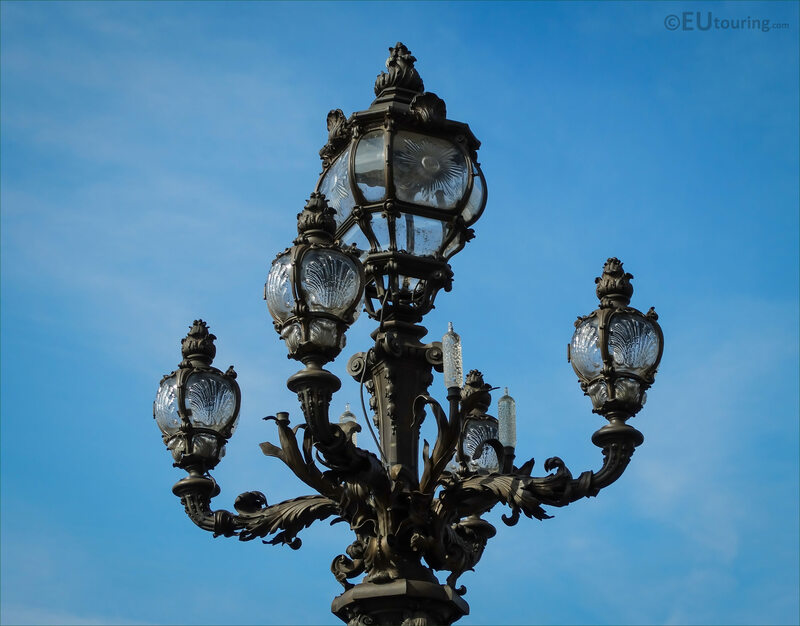 Now this particular ornate street lamp or candelabra is located on the right bank of the River Seine on the downstream side of the bridge in the 8th Arrondissement of Paris close to the Grand Palais, and was inaugurated at the same time as the Pont Alexandre III in 1900 for the Universal exposition. 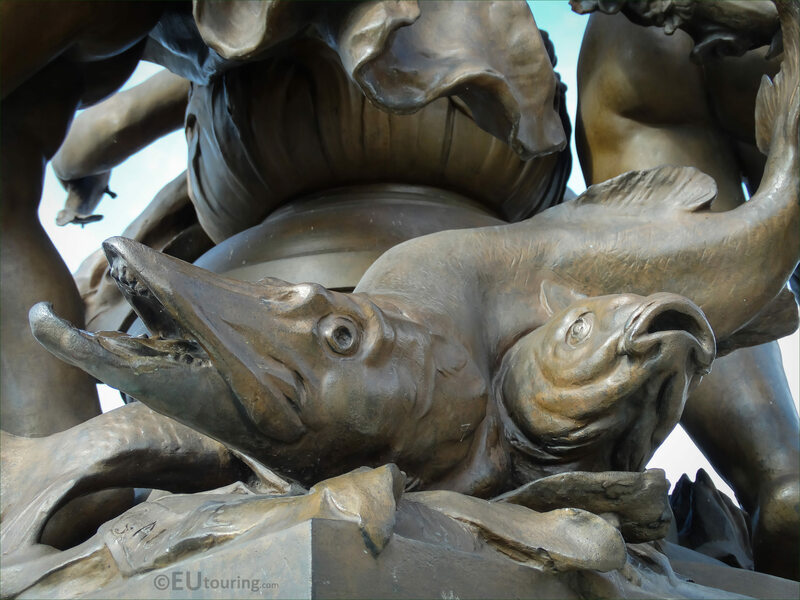 But this next photograph shows a close up of two of the bronze fish, which are at the bottom of the candelabra by the feet of The Loves, however, these are sometimes referred to sea monsters when the Les Amours figures get called cupids instead. 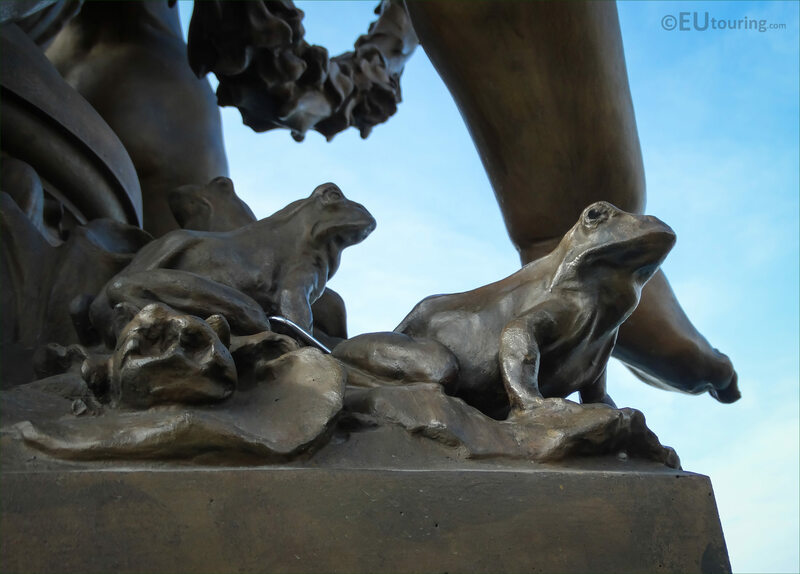 Yet this next close up image shows the frogs that are also located on the base of the same ornate street lamp, just adding to the fine details that were implemented by Henri Desire Gauquie who maintained the theme of aquatic life combined with mythology like you will find with other statues and sculptures on the Pont Alexandre III. 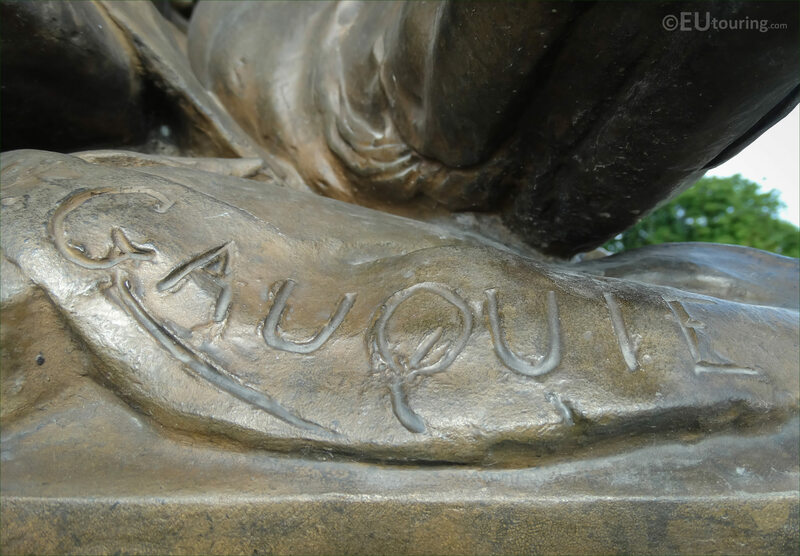 However, this close up photo shows where the artist has inscribed his surname on the base of the candelabra statue of Les Amours, and Henri Desire Gauquie was born in Flers-lex-Lille in the Nord-pas-de-Calais region of France in 1858, initially studying at the Academy of Valenciennes before receiving a scholarship to study at the Ecole des Beaux Arts in Paris. 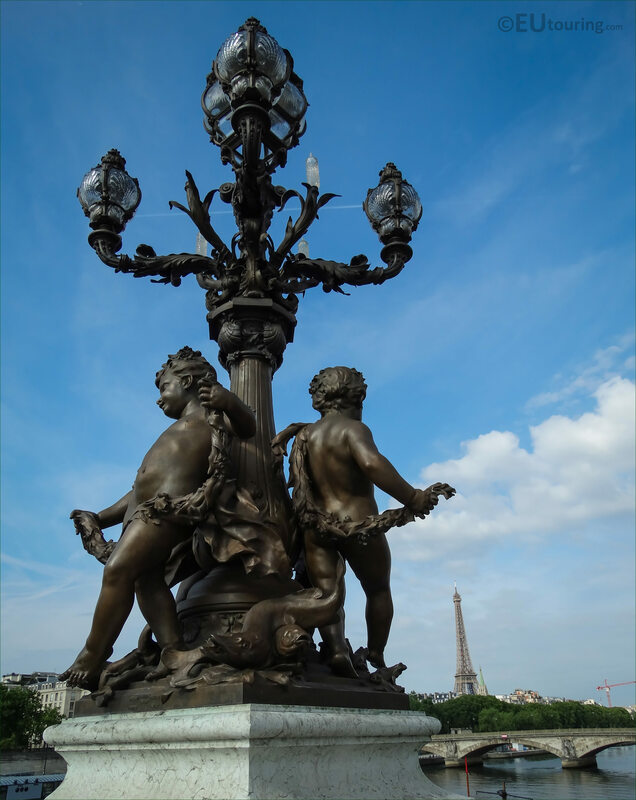 He entered the workshop of Jules Cavelier at the School of Fine Arts and over the next few years received several awards for different works, although some of these have since been destroyed, yet the commissions for the ornate candelabras on the Pont Alexandre III are fortunately still surviving. 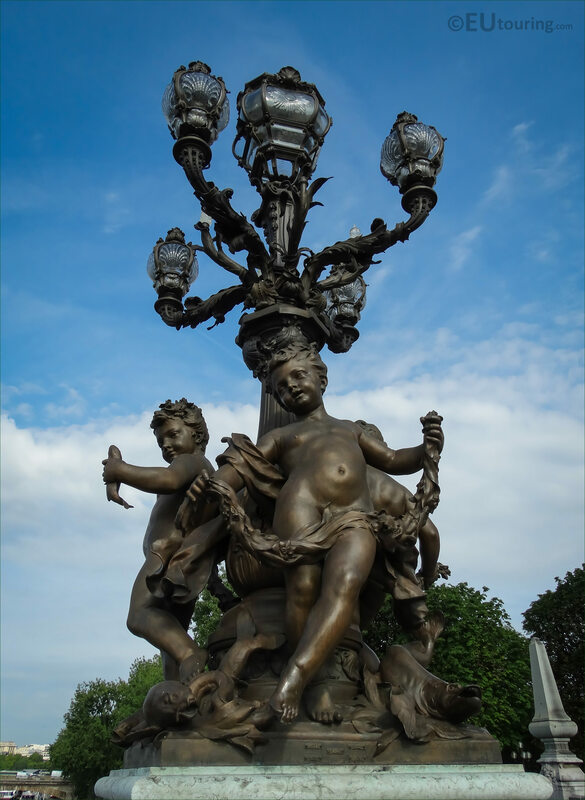 And as well as The Loves also sometimes called The Children, Henri Desire Gauquie also designed the actual candelabras themselves, which were all produced in 1899 and put in place in readiness for the bridge opening, yet another of his works called the Monument to Watteau can also be found at another tourist attraction in Paris called the Jardin du Luxembourg. 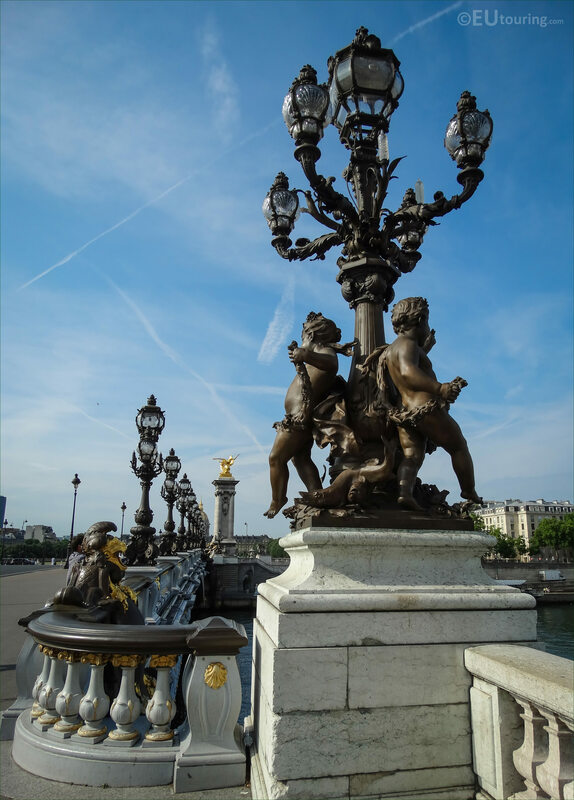 So this last image shows another view of the entire street lamp with Les Amours or children statues holding garlands surround the pedestal below the candelabra top, which is located on the North West corner of the famous Pont Alexandre III bridge.